A homeless Girl was looking for a place to stay. She knocked on the door of an old Man. “May I stay with you?” she asked. The Man looked at the girl and felt pity for her. “You may,” he said, “But with one condition . When I am away, you have to make sure that all doors of the house are closed so that nobody can get in,” the Man said and showed the girl how to close the front door with a lock. “Can you do that?” he asked. “Sure, that’s an easy job ,” the Girl said, and the Man let her in. “Yes, but who would come in through the balcony?” the Girl asked defensively. “Monkeys? Real monkeys? Can they come inside?” the Girl did not want to believe that. “Why didn’t you tell me that before?” the Girl wanted to know. “Oh, I am sorry,” the Girl apologized and promised to be more careful in the future. Next day, the Man went for work again. This time, the Girl kept all doors closed. When the Man came home, she was in the kitchen preparing dinner. “Why were the front doors open ?” the Man asked her. “No, they were closed,” the Girl said. “Oh, I am sorry,” the Girl felt guilty again. 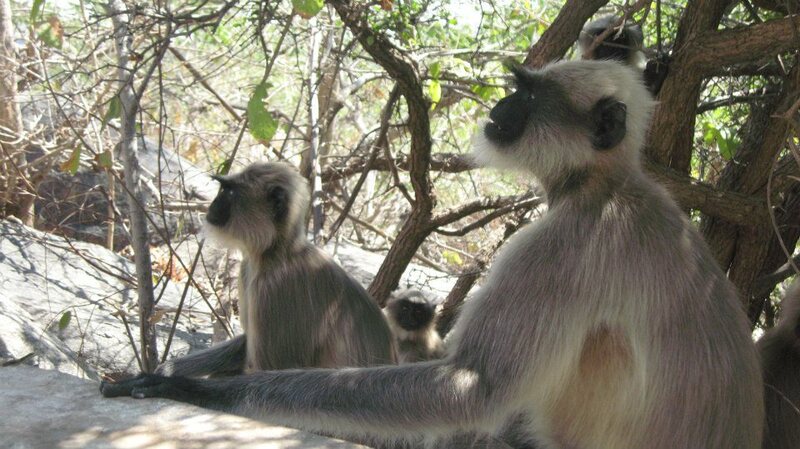 At the same time, she became more interested in the monkeys. Though she had never seen any, she sensed they must be real since the Man was so concerned about them. “How big are they?” she wanted to know. “Pretty big, I would say, half of your size, so please be more careful next time or I will have to ask you to leave,” the Man said. “Ok, sure, I’ll be careful,” the Girl promised. Next morning, the Man was sleeping and not getting up for his work . The Girl had intended to go to a supermarket and buy some bread. It would only take ten minutes. So she thought she would not wake up the Man. He would probably soon wake up anyway to go for work. Moreover, if she locked the door from outside, he would not be able to get out. So she left the door unlocked. When the Girl returned from the supermarket, the Man was in the living room, about to leave for his work. “Why did you leave the front door open?” he asked the Girl. “But what should I have done?” the Girl wondered. Now the girl felt very bad. The Man did not want to let her stay for any longer. However, the Girl persuaded him to give her one last chance. Next day, a Guy knocked on the door. “May I stay at your place ?” he asked the Man. “Sure, that’s easy, I can do that,” the Guy said, and the Man let him in. Next morning, after the Man had gone for work , the Guy went out. When he returned to the house, he was so overwhelmed with the new place that he forgot to close the door as he came in. “Please keep the door closed,” the Girl immediately reminded the Guy. “Monkeys may come in and steal the food,” the Girl said in full seriousness, convinced that monkeys were real, because the Man had seen them and described them to her. While the Guy laughed in disbelief, the Girl thought she had finally learnt the lesson: take care of the other person and his property as if it was yours.